The story of Layla and Majnun is one of the most popular in the Islamic world, enduring in legends, tales, poems, songs, and epics from the Caucasus to Africa and from the Atlantic to the Indian Ocean. Scholars find good reasons to believe that the central character — Qays, nicknamed Majnun (Madman) — lived in northern Arabia in the second half of the seventh century, five hundred years before the poet Nizami. At the behest of the Transcaucasian chieftain Shervanshah, Nizami collected many of the widely dispersed traditional versions and wove them into his great narrative poem. No one knows the number of translations of Nizami's work in the many languages encompassed by Islamic religious culture, but at least forty Persian and thirteen Turkish versions are known, and one scholar states that there are actually over a hundred versions in those two languages alone. An English translation appeared in 1836 which relied on an incomplete text with later additions by lesser poets (this text was used by Eric Clapton in the late 1970s for certain lyrics on his recording Layla and Other Love Songs). The translation by Dr. Rudolf Gelpke [The Story of Layla and Majnun by Nizami, trans. and ed. by Dr. Rudolf Gelpke, English version in collaboration with E. Mattin and G. Hill, Omega Publications, New Lebanon, NY, 1997; all page references are to this edition] published originally in 1966, offers insights into medieval Arabic culture and mores. Though cast in prose, poetry lovers will catch fulfilling glimpses of Nizami's poetic and mystic genius. Moreover, the Omega edition includes the work's final chapter, translated by Zia Inayat Khan and Omid Safi. The story begins with the Sayyid, a man of wealth, power, and prestige, desiring a son and heir. He importunes Allah, who grants his request. The beauty of his son Qays "grew to perfection. As a ray of light penetrates the water, so the jewel of love shone through the veil of his body." At the age of ten, Qays goes to school and meets his kismet/fate, Layla. "Does not 'Layl' mean 'night' in Arabic? And dark as the night was the color of her hair." Love struck them both; others noticed, tongues wagged, and Qays first tastes bitterness. He refrains from seeing her, but his heart breaks and he begins to slip into melancholy. Layla's tribe, to protect her (and their) honor, deny her right to see him, and he falls into madness: "A madman he became — but at the same time a poet, the harp of his love and of his pain." In time Majnun runs away into the wilderness, becoming unkempt, not knowing good from evil. His father takes him on pilgrimage to Mecca, to seek God's help in freeing him, but Majnun strikes the Kaaba and cries "none of my days shall ever be free of this pain. Let me love, oh my God, love for love's sake, and make my love a hundred times as great as it was and is!" He continues to wander "like a drunken lion," chanting poems of Layla's beauty and his love. Many come to hear him. Some write down the poems he spontaneously speaks. she lived between the water of her tears and the fire of her love, . . . Refusing suitors, she writes answers to his poems and casts them to the wind. It happened often that someone found one of these little papers, and guessed the hidden meaning, realizing for whom they were intended. Sometimes he would go to Majnun hoping to hear, as a reward, some of the poems which had become so popular. . . . Eventually Layla is married to another, but refuses conjugality. Being in love, her husband accepts her condition of an outward marriage only. Majnun learns of the marriage and of her faithfulness. Neither his father nor his mother, when near death, can induce him to return to his people. Wild animals, loving rather than fearing him, congregate in his presence, protecting him. One night Majnun prays to Allah, thanking Him for making him the pure soul he now is and asking God's grace. He sleeps, and in his dream a miraculous tree springs from the desert, from which a bird drops a magic jewel onto his head, like a diadem. After the death of Layla's husband, she openly mourns her love for Majnun, and dies shortly thereafter. 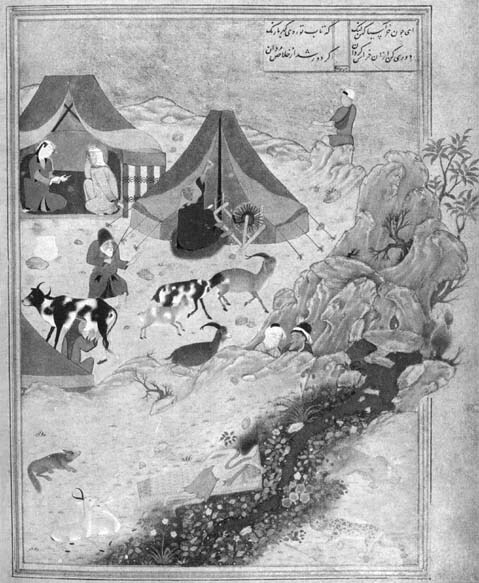 Majnun hears of her death and, mad with grief, repeatedly visits her tomb. He dies and is buried beside his beloved. So ends Nizami's poetic narrative of the story of Layla and Majnun, but to really appreciate and understand this work, it needs to be read, and savored, in full. Is their story a medieval soap opera of epic proportions? It is, if that's what your heart hears. Is it a cautionary tale inculcating acceptance of earthly injustice and suffering in the Islamic faithful, who will be rewarded in the great by-and-by? It will surely serve, if that's your concern. Is Majnun "Man" and Layla "Soul," suffering because denied union while bounded by flesh? Yes, if your concern, your love, leads you to hear it that way. Is it an allegorical Sufi text, instructing seekers in practical means for awakening to the supernal reality of their true, spiritual nature? Only our hearts know for sure — Nizami bids us follow them.